The Englishman is now FREE! To celebrate the publication on 18th November of The Good Officer, the first novel in my contemporary Nordic romance series, The Englishman, is now FREE to download. Tap the picture or go here for the US Amazon page to download the book now. But hurry, this offer ends on Sunday 6th November! A Nordic romance – based on true events. 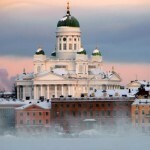 When a young Finnish student Kaisa is invited to the British Embassy cocktail party in Helsinki to celebrate a Royal Navy visit to Finland, she’s not looking for love. After all, her future has been carefully planned: she’s to complete her degree, marry her respectable, well-to-do Finnish fiancé Matti, and live happily ever after. Enter the dashing Peter, a newly qualified Royal Navy officer. Like a moth to a flame, Kaisa falls head over heels in love with the handsome Englishman. The young lovers steal passionate kisses in the chilly Esplanade Park and promise to meet again. Kaisa and Peter embark on a long-distance relationship, but in the 1980s, at the height of the Cold War, while the Englishman chases Russian submarines, Kaisa is stuck in Finland, a country friendly with the Soviet Union. Kaisa lives for the Englishman’s passionate letters and infrequent long-distance phone calls, but her jealous ex-fiancé doesn’t want to let go, and her old-fashioned father hates foreigners. Can Kaisa trust the gregarious Englishman? Wouldn’t she be better off going back to her faithful fiancé? Can the love between Kaisa and the Englishman last and go the distance? 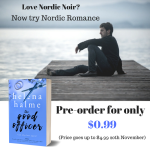 This Scandinavian romance is based on true events and attracted thousands of readers when first published as a series of blog posts on Helena Halme’s blog. The Englishman is quite the page-turner, I had difficulty stopping myself from devouring it in one go. All the small details about Finland and Sweden give the book such colour, and I love seeing England through Kaisa’s eyes! Highly recommended! – Tania Hershman, author of My Mother Was an Upright Piano. Download a free copy of the THE ENGLISHMAN now!